As civic participation is declining in western societies, emerging technologies offer novel opportunities for outreach activities. This chapter presents a series of incremental studies of interactive public displays to inform and elicit feedback about a local renovation project, with emphasis on civic engagement. 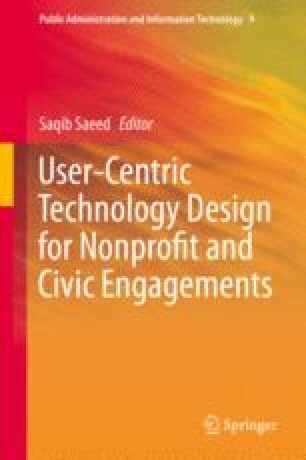 Two questions are explored: (1) how does the public use and appropriate this technology for civic engagement? and (2) how can the design of feedback mechanisms improve the collected feedback? We describe how users appropriated this technology beyond its original purpose and show that feedback mechanisms promoting rapid interaction or a sense of community lead to increased participation. Through our study we highlight factors to consider in designing future civic engagement applications for public displays. This work was supported by Microsoft Research through its PhD Scholarship Programme. The financial support of the Finnish Funding Agency for Technology and Innovation, the European Regional Development Fund, the City of Oulu, and the UBI (UrBan Interactions) consortium is gratefully acknowledged.